... is under there somewhere. Guess what my weekend project is? I'm finishing the crown on top and trying to locate the floor and table. Yup, its been one of those weeks... Pop over here to see some much more orderly creative spaces. giggles* the key to a creative space is to clean it then photograph it lol so it looks like your super organised! I just clean a space off on the desk them Im good to go lol the rest looks like a bombs hit it! 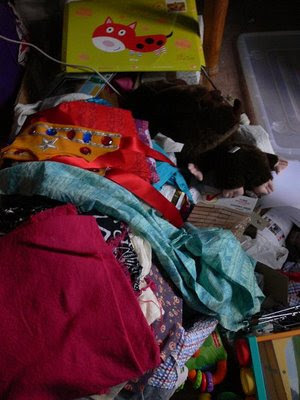 I'm sure there's plenty of fabric treasure in that pile.